Westminster is an area of Central London, within the City of Westminster . It lies on the north bank of the River Thames, southwest of the City of London and southwest of Charing Cross . It has a large concentration of London 's historic and prestigious landmarks and visitor attractions, including Buckingham Palace and Westminster Abbey . Historically a part of Middlesex , the name Westminster was the ancient description for the area around Westminster Abbey – the West Minster, or monastery church, that gave the area its name – which has been the seat of the government of England (and later the British government) for almost a thousand years. Westminster is the location of the Palace of Westminster , a UNESCO World Heritage Site which houses the Parliament of the United Kingdom . The name Westminster describes the area around Westminster Abbey and Palace of Westminster , – the West Minster, or monastery church, west of the City of London's St Paul's, that gave the area its name–which has been the seat of the government of England for almost a thousand years. The name is also used for the larger City of Westminster which covers a wider geographical area; and, since 1965, has included the former boroughs of Marylebone and Paddington . The monarchy later moved to the Palace of Whitehall a little towards the north-east. The law courts have since moved to the Royal Courts of Justice , close to the border of the City of London. The area is still the centre of government, with Parliament now located in the Palace of Westminster and most of the major Government ministries situated in Westminster, centred on Whitehall . "Westminster" is thus often used as a metonym for Parliament and the political community of the United Kingdom generally. The civil service is similarly referred to by the area it inhabits, "Whitehall", and "Westminster" is consequently also used in reference to the Westminster System, the parliamentary model of democratic government that has evolved in the United Kingdom . The Westminster System is used with some adaptation in many other nations, particularly in the Commonwealth of Nations and other parts of the former British Empire. Close to the Palace of Westminster and Westminster Abbey is Westminster School , one of the major English public schools. 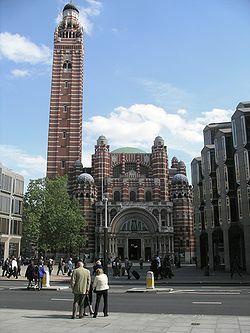 Three of the four campuses of the University of Westminster are within the greater London borough of the City of Westminster , although none in the ancient area of Westminster. The area has a substantial residential population, a surprisingly large proportion of which is a traditional London working class community living in council and Peabody Trust estates at the back of Westminster Abbey and off Millbank . There is also a substantial working class community in the north of the borough. The term Westminster Village, sometimes used in the context of British politics, does not refer to a geographical area at all; employed especially in the phrase Westminster Village gossip, it denotes a supposedly close social circle of Members of Parliament, political journalists, so-called spin doctors and others connected to events in the Palace of Westminster.